Marklin’s Florien Sieber, a new addition to the management team since 2013, has worked to expand the company’s product offering since the Simba-Dicke takeover in 2013. The company’s financial position has improved overall but the company missed its target growth rate for 2015/16. Sales reached 96 million Euros worldwide, 2 million Euros less than the fiscal year prior. Mr. Sieber has noted that enthusiasts often substitute purchasing new Marklin products with second-hand items that were perhaps produced decades ago. Many Marklin fans purchase toys and trains from their childhood for the added nostalgia and historical value. Since many enthusiasts have fixed budgets, if they purchase more second-hand items, they have less spending money for the newer Marklin models. There is no question that culture and demographics play a huge role in the changing market for toys and model trains specifically. While older generations grew up playing with train layouts, newer generations play with high-tech toys like video games and computers. Marklin’s introduction of the “Start Up” and “My World” product lines helped target this segment, which Sieber notes has shown 30% growth last year. While it’s hard to track these changing trends, one interesting proxy is analyzing search queries as a gauge of interest in a particular topic. 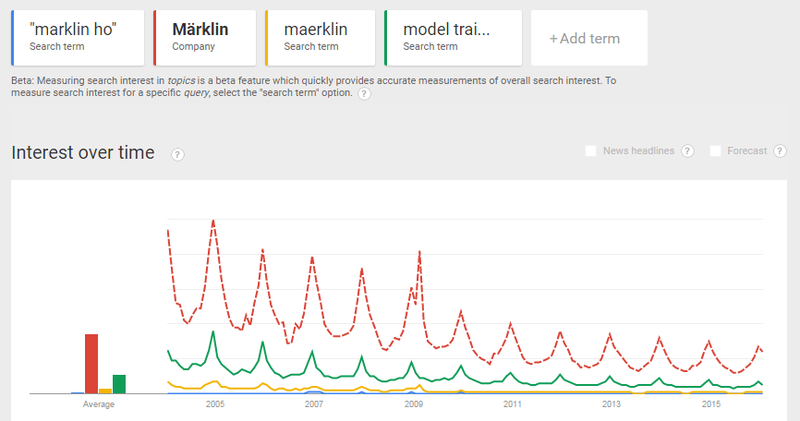 In looking at the searches for “marklin” on Google, there is a steady decline over the years, with notable spikes during a particular holiday. One thing is certain: Marklin trains will always be found in one way or another under the Christmas tree! I don’t think it’s actually that simple. Of course you can sometimes save money by buying second hand items. But having a working second hand market proves that the product is good and retains its value even when used, which is usually considered a good thing. That is why one is willing to pay a premium when buying new. Also, some of the second hand market is people selling off old items to fund new purchases. The availability of inexpensive options also maintains brand loyalty and interest in the hobby – the buyers of used Märklin trains today are future buyers of new ones. 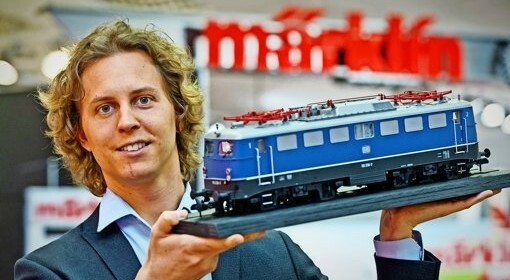 Myself I’m a new Märklin customer, after having been in the two-rail camp for decades. (Not going into the reasons for the switch, this comment is long enough already.) I got my first Märklin set (new) a couple of years ago, and I’ve been expanding it with both new and used items. And here lies the problem: I have a specific era and location that I’m modelling. I also want to model prototypical train compositions. If I only bought new Märklin items, I would have to wait years, if not decades, for the proper models to become available – and I would most likely stay away from Märklin entirely, sticking to two-rail systems. However, an adequate selection has been produced in the past. So, in my case, the second hand market keeps me buying new items as well. I wish Marklin would produce some New Maxi-Metal 1 Gauge Products – Like USA Passenger Cars and Metal Stations/ Houses Ect .. Buildings and Accessories. I also would like Marklin to Make The Reproduction Leipzig Grand Central Station in Germany. Thanks Stan -Dallas, Texas. I really wish Marklin had some USA Support….my local dealer. Willis Hobbies Can’t do anything because he has zero support…. I’m a dealer in the USA (originally from The Netherlands) agrees with you and your dealer. Support is 0% except for the lady who is supposed to only run the Märklin Club (Insider, whatever the name is today). She’s my ONLY rock!